Primary Natural Resources petroleum, nickel, rare woods. 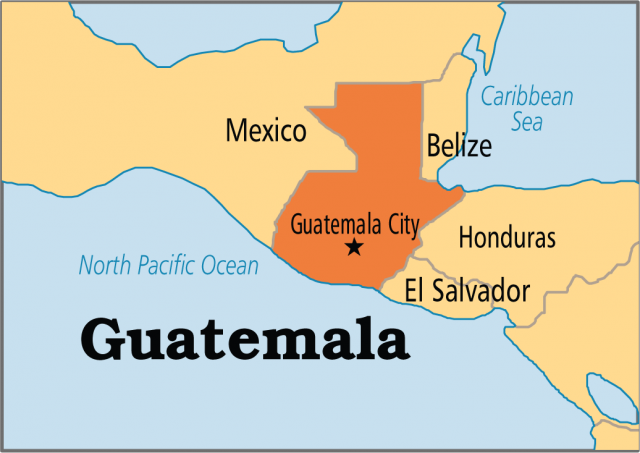 THE REPUBLIC OF GUATEMALA is located in Central America and is bordered by the PACIFIC OCEAN, the Gulf of Honduras, otherwise known as the CARIBBEAN SEA, and four countries (EL SALVADOR, HONDURAS, BELIZE, MEXICO). The total length of the borders is about 1,296 mi (2,087 km), and the landscape is largely mountainous, with a limestone plateau. The two coastal areas are very narrow. Latino and Amerindian are the two major ethnic groups in Guatemala. The mountainous areas of Guatemala are home to over 30 volcanoes. Many volcanoes are still active and this area experiences occasional earthquakes and volcanic eruptions. The Caribbean coastline is very narrow and beaches are nonexistent, while the Pacific coastline is characterized by black-sand beaches. Guatemala is intensely cultivated and agriculture employs 50 percent of the workforce; some people work on sugarcane and banana plantations. Guatemala also features the Peten RAINFOREST, which is an archaeological treasure where many dinosaur bones can be found in the soil. However, the existence of the Peten rainforest, located within the interior of Guatemala, is being threatened as trees are being cut down. Soil erosion and water pollution also pose a great concern for the environment. Guatemala has a tropical climate that varies with elevation. The country’s coastal regions are generally hot throughout the year, with usual temperatures reaching up to 100 degrees F (38 degrees C). The summer seasons are hot and humid, while winters are warm and dry. These regions are susceptible to hurricanes and other tropical storms. The highlands are generally wet and cloudy during the summer, and the temperatures are not as hot as in the coastal regions because of the higher elevation. The climate in the Petén rainforest is mostly wet year-round. Summers are hot while winters are warm. There is a brief dry season from February to April. The rainforest is home to a variety of wildlife, which is in danger because of deforestation. The quetzal, the national bird, is almost extinct. Pumas, jaguars, ocelots, deer, tapir, and margay are among many of the animals living there.